Celebrate water and learn more about your local watershed. Sponsor a Make A Splash Festival with a Project WET! Water Festival Grant. Festivals are held on weekdays during Spring (May and June) and the Fall (September and October). The celebrations were designed to engage students from in hands-on water lessons and investigations. It is the goal of Project WET and our water festival to promotes an awareness of and respect for water resources through a non-biased approach. 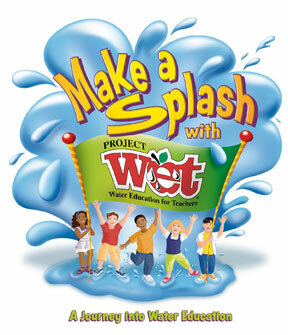 This statewide effort, titled "Make a Splash with Project WET," is organized by the New Jersey Project WET (Water Education for Teachers) Program sponsored by the NJ Department of Environmental Protection. New Jersey Project WET provides the grant funds to support each of the festivals. A Water Festival usually consists of six to ten structured learning stations where students actively participate in educational lessons to learn how water is managed or where their drinking water comes from or what river is closest to their school. Students explore more than just the science and history of water. They will learn about the physical property of waters at the H2Olympics Station; they will act as molecules and go on an Incredible Journey; and, they will discover ways water is managed and shared here in their watershed.